The first step I take when approaching a book is to gather reference materials, do research and decide on how I am going to approach the book. ‘A Pod of Orcas’ is a seaside counting book. In this case, the seaside located on the West Coast. 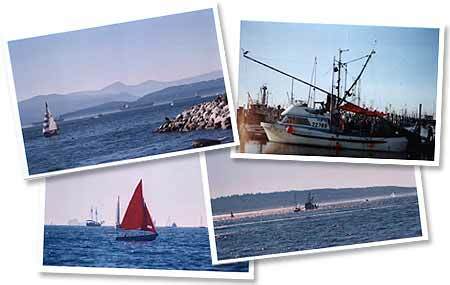 The author, Sheryl McFarlane, lives on Vancouver Island so the seaside around her home was her inspiration. I live in Vancouver very close to the water so the seaside around my home and the surrounding parks were my inspiration for the locations. 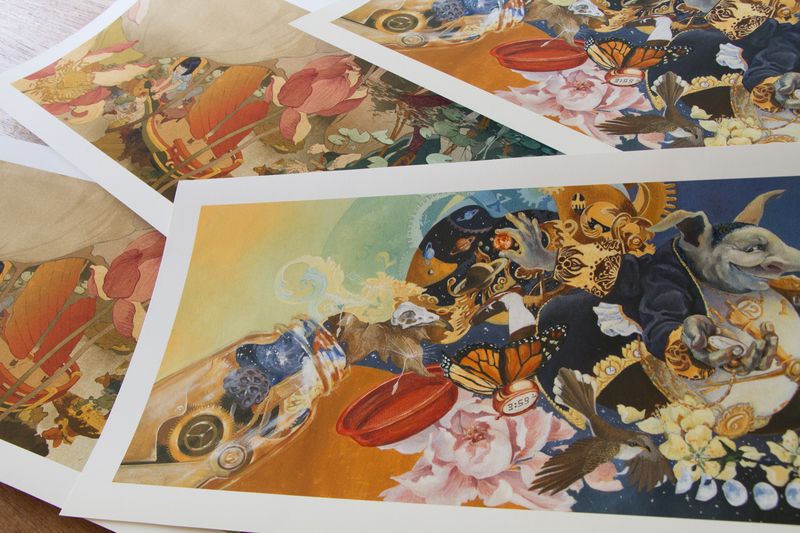 I decided to paint the illustrations in watercolour. To me, this medium best represents how I felt about the West Coast, the blustery days, the rocky shores, the blue mountains and the sparkling summer waters of the bay. 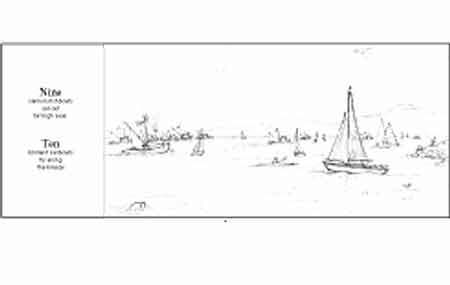 Once I had decided on the general look of the book I did some quick sketches of each page and then went out and shot lots of photographs of beaches and sailboats, fishboats, seals, beach umbrellas, clouds and anything else I thought I might need to use in the book. After the thumbnail stage comes the rough stage. I develop the drawing further, and add more detail. 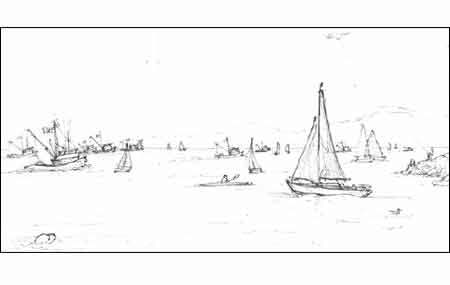 This is the stage where I make sure that there are the right number of boats in the illustration and that they are located far enough from the book’s gutter that they don’t get lost in the crease. 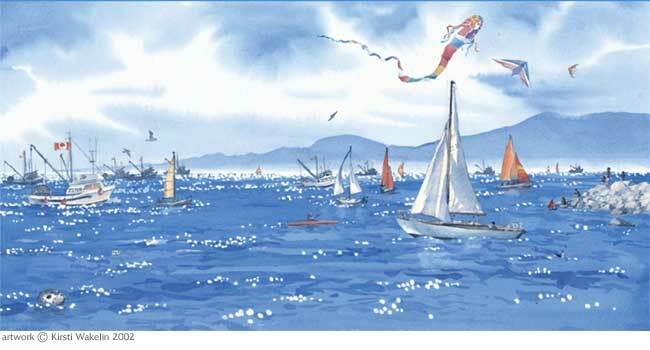 I also add other details such as a seal, a seagull, people flying kites and paddling kayaks. These things aren’t mentioned in the text but help to add life to the scene. Once I have finished the rough, I place in the text to get a better feel for what the page will look like. This gives me a better idea of how the text and illustrations are going to balance in the book. 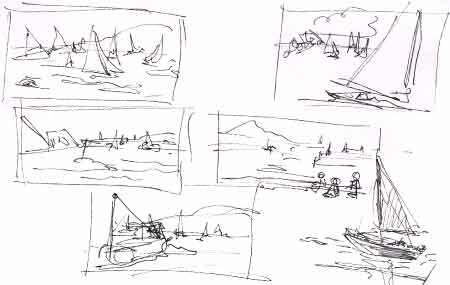 This is a storyboard. 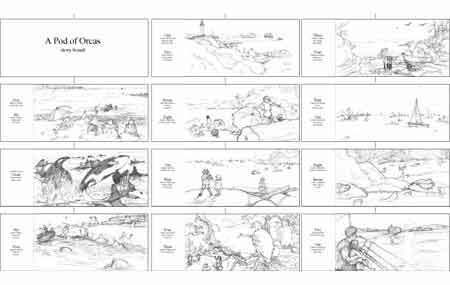 Once all the roughs are finished I lay them out in order to see how they all work together. This gives me an opportunity to see check the overall balance of the book. I submit this as well as the roughs to the publisher for approval. When I have the publisher’s approval on the roughs I can draw the images onto watercolour paper and complete the final stage of the illustration.